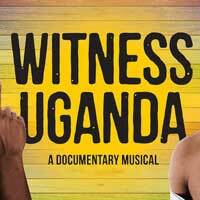 A groundbreaking documentary journey that's been turned into "a vibrant, pulsating musical" (Associated Press), Witness Uganda is inspired by the true story of a young gay man's trip to volunteer in a small village in Africa. But his sincere desire to help is tested against the backdrop of an incurable epidemic, corruption and a dangerous abduction that leaves him questioning everything he has ever known. After a successful off-Broadway run, this West Coast premiere at The Wallis in Beverly Hills is set to star 12-time Grammy nominee Ledisi, Jamar Williams (Wild Goose Dreams), Amber Iman (Hamilton) and Emma Hunton (Wicked). "...A gay black NYU student heads off to Africa to help build a school only to come back transformed for life in Witness Uganda, Matt Gould and Griffin Matthews' off-Broadway "Documentary Musical" thrillingly performed and excitingly restaged for L.A. audiences at Beverly Hills' Wallis Annenberg Center For The Performing Arts." "...The performers are all very good, and some are tremendous. At the top of this list is Ledisi, the 12 times Grammy-nominated soul singer who lights a fire under this musical whenever she's onstage - which is too infrequently. Sha'Leah Nikole Stubblefield, as a Ugandan student hungry for an education, makes the most of her moments in the spotlight. Jamar Williams in the lead is charismatic and engaging, but his character is confusing. He's a decent singer, but he is often overshadowed by Ms. Hunton, who belts out her songs with a gusto that blows him off the stage."